The first thing you notice on arrival at CERN is the large number of overhead power lines which seem to be heading into some rather unassuming buildings on the Franco-Swiss border near Geneva. Other than this, there is very little hint of the extraordinary things that are going on 100 metres below your feet. When entering the reception building at CERN, it isn’t long before you find out why all these power lines are needed. When fully operational, CERN consumes as much electricity as the city of Geneva and takes 15% of the entire output of a nuclear power station based in France! Flamsteed members had first expressed an interest in a trip to CERN following Professor Jon Butterworth’s lecture to the society in October last year. 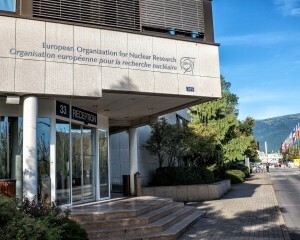 This was duly organised and 24 Flamsteed members made their way to Geneva for a tour of the CERN site. 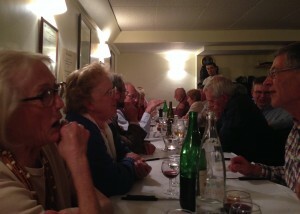 Most of us travelled to Geneva on the Friday afternoon and met for a drink in a hotel on Friday evening. However, several people arrived a day earlier, on Thursday, and thoroughly enjoyed visiting Geneva, with highlights including the Patek Philippe Museum and the Museum for the History of Science. Something to consider for our next trip, I think! On Saturday morning, we met at CERN reception, initially to visit the permanent exhibitions “Microcosm” and “Universe of Particles”. Microcosm tells the story of CERN and includes equipment from old experiments. There are some interesting hands-on experiments and a mock-up of the Large Hadron Collider tunnel which many of us enjoyed having our picture taken in front of! Across the road in the “Globe of Science and Innovation” is the Universe of Particles exhibition. This is a much more modern affair, dotted with ‘pods’ containing information on CERN’s activities. Of particular interest to many was the first WWW server, the NeXT workstation used by Tim Berners-Lee as the first ‘World Wide Web’ server in 1990. Extraordinary to think how much our world has changed as a result of this… and even more extraordinary that it was only 23 years ago! Every half-hour, there is a 6-minute show telling the story of the Universe and the mysteries that physicists want to solve with the Large Hadron Collider (LHC). In one corner of the room, there was a ‘spark chamber’, which lit up each time a cosmic ray from outer space went through our atmosphere creating new particles… fascinating to watch. By the time we’d all made our way through these exhibitions, it was time for lunch. 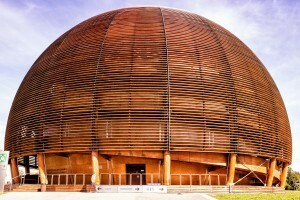 I’d arranged for us to have lunch in the CERN restaurant, which meant passing through security. It was somewhat bizarre, having done this, to be pointed generally in the direction of the restaurant and be told to make our own way there… down stairs, through corridors and across courtyards! We found it in the end, after a couple of wrong turns! Lunch, it has to be said, was excellent. After lunch, it was time for our tour. We made our way into a lecture room first of all, where we were treated to a very interesting talk about CERN and the various experiments. Then it was time to visit some of the experiments. Our first stop was the Magnet Test Facility. This area is used to test magnets at very low temperatures (1.9K) and high currents (20kA) for the accelerator. The low temperature makes the magnets super-conducting, so the facility is used to ‘train’ the magnets before they are installed in the LHC. Then we went to visit the ATLAS experiment. Sadly, it wasn’t possible for us to go below ground, but we were able to see the control room and were treated to a very interesting 3-D film about the experiment. The ATLAS detector itself is about the size of a small tower block – 45 metres long, 25 metres in diameter and weighing 7,000 tons. When two elementary particles collide in the ATLAS detector a variety of different particles with a broad range of energies are produced. In the ATLAS detector, there are about a billion collision events per second, producing an unimaginable 1 petabyte of raw data… that would be enough to fill up over a thousand home computer disc drives every single second! Various filters and triggers are enacted to reduce this volume of data, so that only a few hundred events per second are stored for further analysis, but this still requires over 100 megabytes of data storage… at least 1 petabyte per year. Our guide talked us through the various components of the ATLAS detector. It was particularly interesting to learn that the CMS detector, situated on the other side of the 27km LHC, was independently designed with completely different hardware and software. The two teams work separately from each other, meaning that if a result is found by one detector and then corroborated by the other, we can be certain that the result is real and not as a result of some artefact within the design. In July last year, both the ATLAS and CMS teams announced indications of the presence of a new particle, which looks like it is the elusive Higgs boson. The Higgs boson is crucial to the Standard Model of particle physics. The Standard Model predicts that particles have no inherent mass, but gain this mass by passing through the Higgs field. Like all other fields covered by the Standard Model, the Higgs one would need a carrier particle to affect other particles, and this particle is known as the Higgs boson. The tour was absolutely fascinating and everyone seemed to really enjoy it. Perhaps the lectures on particle physics theory were a little daunting at times, but it was impossible not to be impressed by the sheer scale of what has been built at CERN and the fundamental questions about our Universe that they are attempting to answer. At the end of the tour, with my head still whirling with what I’d seen, it was difficult to concentrate on the next task in hand… getting on a tram to go into Geneva for dinner! Life all seemed very mundane in comparison to the extraordinary things we had been told about. Anyway, back to real life, and the transport system in Geneva was truly excellent. Getting around was really easy, with live displays on the trams and buses showing where you were situated. Dinner was at the Café du Soleil, a restaurant that claimed to make the best fondue in Switzerland! It was a great success… the food was very good, and I can certainly vouch for the fondue. It was also a great atmosphere, and our group of Flamsteed members had a thoroughly good evening out. I flew back to London at lunchtime on Sunday, but a few people took the opportunity to spend the day in Geneva. The weather was marvellous all weekend, so wandering around Geneva must have been very pleasant. For those who got the late afternoon flight back to London City airport, there were a couple of hiccups, with the plane having to return to Switzerland, but they all got home safely in the end… if a little later than expected! All in all, it was a thoroughly enjoyable trip. It was a pleasure to organise it, in all honesty. Everyone in the Flamsteed group got on really well… a great group to travel with. Will we do it again? Yes, without doubt. Watch this space!